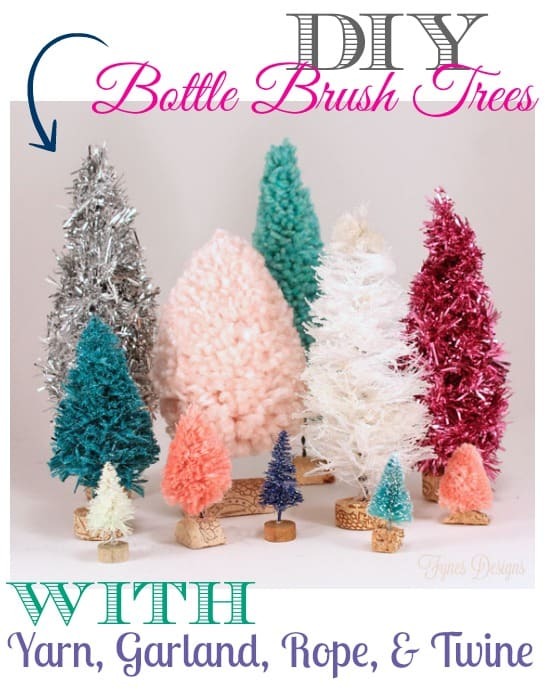 There are ooooodles of posts online about creating your own bottle brush trees. I thought I’d add to the mess! Creating your trees from unique materials such as yarn, twine, garland, and nylon rope, you’ll be sure to have the coolest trees on the block! Revised: Now you can buy a DIY Holiday Handmade kit, Click HERE. Get yours today!! Cut strands of rope (mine is nylon, I just used what we had), untwist it a bit but don’t feel you have to go crazy it will separate a bit when you twirl it. Pinch each end of your wire with the pliers and give a few twists. You can then drop one pair of pilers and twist with your hand, until you feel it is tight enough. Make sure your stump is well twisted. At this point it will look terrible, like a fat pom pom. Trim the tree, cut a wine cork (in a slice for small trees and lengthways for larger trees) poke wire into the cork to stand your tree. 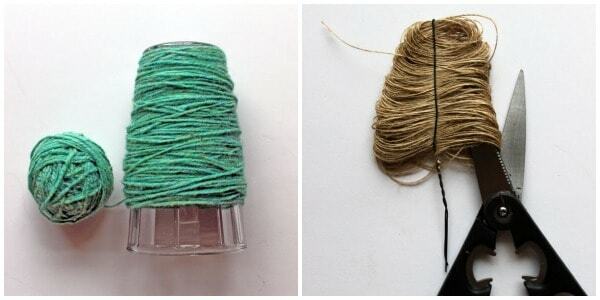 Rather than cutting strips when using yarn, twine, string or garland you can wrap it around a glass and slide it off. A few of the trees I chose to dye (like the green one above) check out this tree dying video for tips. Who knew you can bleach traditional bottle brush trees? How will I display my little forest? I picked up this wooden crate at the thrift shop that makes the perfect display box. The yarn trees were by far the easiest to shape, and what a perfect way to use up scrap pieces. Want to make these quick and easy? BUY the DIY kit now, with all the materials included. You’ll just need scissors and pliers! I hope you enjoyed this little tutorial. 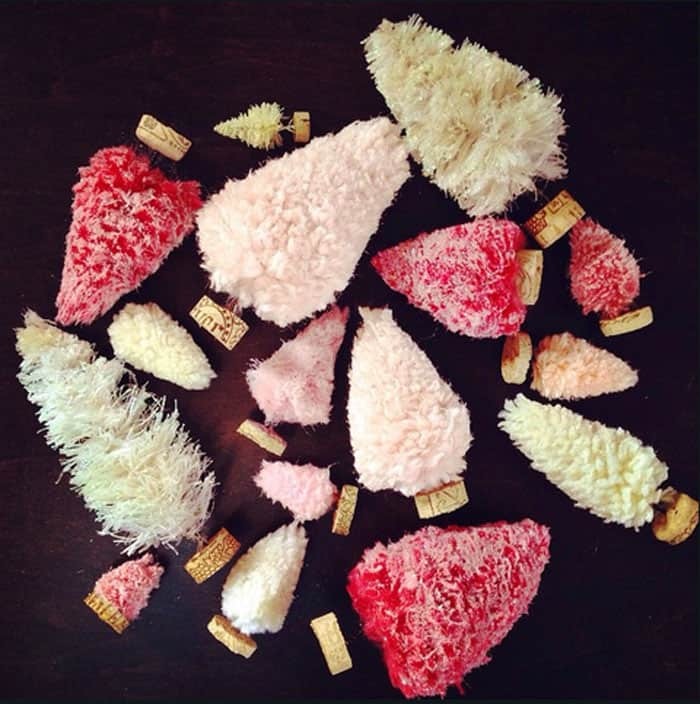 Have you hauled out your Holiday decorations yet? I’d love to see. Pop by my FB page and share what you’ve been doing! 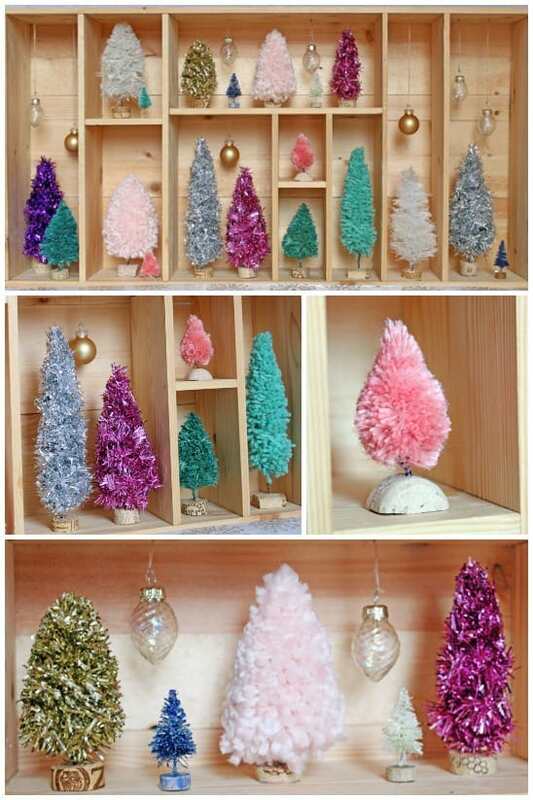 If you like these little Christmas trees, you’ll probably love these 99¢ trees too! Like Cheap Christmas ideas? You’ll love this 1 hour Beginner Cowl, makes the perfect gift, and NO skills required! These look great. Love how they turned out, and they look amazed displayed together in the wooden crate -great job! Thanks Dannyelle!I’m glad you stopped by! Amazing! Who knew you could make all these tiny trees? Not sure I am brave enough to try, mine would probably look all wonky! I’m sure yours would turn out lovely, give it a go! At worst you’re out a ball of yarn! I had no idea these were so simple! What a fun project, I’ll be giving it a try, Thanks! How do you do the purple garland one? Would you cut then in half short ways and lay them all together? Hope that makes sense. Super amazing!! I simply love these! 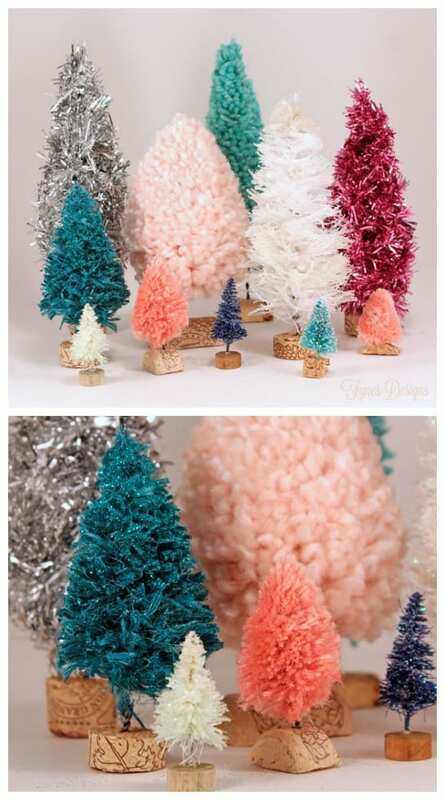 Those poofy yarn trees are soo cute! Pinning to our Monday Funday board. Thanks for linking! I love these! I always wondered how people got all those great colours. These are so sweet and so ingenious!!! Great job Virginia!!! I’ll have to give this a try…. These are so Cute! I love what you did with them! Awesome! Thank you for Sharing your Brilliance! Those trees are so adorable. One thing i found for the yarn trees was to brush them with a wire brush – such as a cat brush. This made my yarn trees fluffier since I guess I didn’t use enough yarn to make them as fluffy as the picture. I for sure want to make some more in other colors! You my have tried this already, but if you use a drill on one end and hold the other end with the needle nose pliers you will get a more consistent twist. If using the yarn around the bottle method do you twist the wire first, then cut the yarn? I love these so much I might be making 100 today!!! Thanks for the cute idea! This is so easy! Thank you so much for this tutorial! I wish I could know about it in 2013 :< I made a very ugly small Xmas trees for my club that year from paper that year.